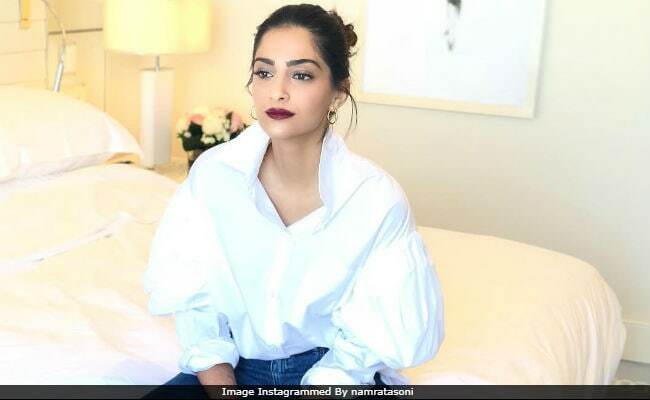 We've seen how Sonam Kapoor rocks her denim looks like a pro and on Day 2 of the ongoing Cannes Film Festival, her OOTD is a white loose shirt and denim. Oh! By the way, did we forget to tell you she's wearing Bhane? Sonam has picked her outfit from her husband Anand Ahuja's fashion label. The 32-year-old actress has aced her look with gold earrings and a dark lip colour. (It cannot stylish than this, trust us). Sonam Kapoor's look of the day is major summer vibes and we just loved it. Sonam walked the red carpet on Monday night and will wrap up her Cannes duties today. Take a look at Sonam's chic appearance at the French Riviera. This is what #SummerEscape dreams are made of! @Sonamakapoor sports Infallible Pro Matte Liquid Lip in Forbidden Kiss. Last night, after making a glam red carpet appearance, Sonam rocked a Delpozo outfit during the Auction dinner. Sonam Kapoor made a traffic-stopping appearance on the red carpet in an embellished off-white lehenga by Ralph and Russo. She accessorised her look with a pair of studs and a ring. Sonam styled her braided hair with a paranda. (Her mehendi is still visible). Sonam Kapoor checked in the French Riviera in a black and white maxi dress from the studios of Mother of Pearl. She aced her look with Chloe boots, a black tote bag by Bottega Veneta and trendy sunglasses. "Hey Cannes," Sonam captioned her posts. Sonam married businessman Anand Ahuja on May 8 in Mumbai. Over the weekend, the couple travelled to Delhi, Anand's hometown and from there, Sonam took a flight to the French Riviera. This is Sonam's eight year in Cannes. She is representing cosmetic giant L'Oreal, for which actresses Deepika Padukone and Aishwarya Rai Bachchan earlier walked the red carpet.